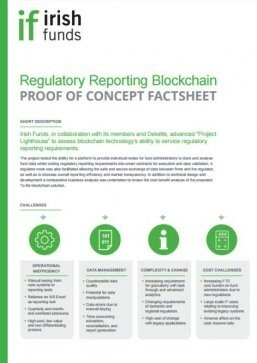 In 2016, Irish Funds and Deloitte embarked on a 10 week Proof of Concept (PoC) to build a blockchain based regulatory reporting platform, ‘RegChain’. In order to understand how the technology could bring the greatest value, it was essential to understand the challenges related to the traditional regulatory processes prior to the design and build of the Prototype. Several successful brainstorming sessions occurred amongst the Irish Funds working group which consisted of several fund administrators. The choice was made for this PoC to focus on Money Market and Investment Funds (MMIF), which is a quarterly return for all Irish Domiciled funds. However, after discussions with the working group, it was decided that the PoC would be built in such a way that it could be applicable to all regulatory reporting processes which require the sharing of high volumes of data securely. Other examples identified included regulations such as AIFMD Annex IV Reporting. Additional resourcing to meet the new regulatory requirements. Offshoring functions and teams to lower cost centres to help manage the cost of servicing. Re-engineering internal processes for more effective regulatory processing. Shoe horn new bespoke solutions into the legacy system architecture. Although these actions have helped in the short term, they have not fixed the bigger problem which is the sustainability of current processes. MMIF reporting is operationally inefficient due to its heavy reliance on Microsoft Excel to crunch the numbers. As with many processes which are largely manual, there is the potential risk of data manipulation and human error. Furthermore, the ever changing nature of these regulations has increased the burden on fund administrators, which naturally, has led to increased costs. So the real question, why blockchain? A blockchain is a highly secure, tamper proof, shared online ledger, enabling organizations to exchange value with no third party involvement, with the ability to store assets, identities, contracts and more. This technology can bring real benefits to the regulatory reporting process due to a number of its features and characteristics which can enhance the overall ability to meet reporting requirements. Data integrity - Due to the blockchain’s hashing capability, data that is entered on the blockchain is extremely difficult to alter. Once approved by consensus it is immutable. Any change to data can be tracked in the chain reducing the possibilities for fraud or malpractice. Reliability - Blockchain does not have a central point of failure and is better able to withstand malicious attacks. Disaster recovery is inherently built into a blockchain as standard due to all parties having a copy of the ledger. Storage and Speed - The blockchain provides for near real time updates of data across nodes. This facilitates faster sharing and access to data, with entities such as a regulator. Analytics - By providing a single source of accurate and immutable data the blockchain, a repository of transactional and fund data, can be used to develop greater analytics. A singular view of each participant’s positions across all asset classes can be made available assisting in overall management efforts and MIS collation. The next steps for the project team and industry group will be to review the Proof of Concept and the practical production questions it has raised. Following this, a business decision will be made on whether or not to continue with the solution and advance to a pilot stage. However, what we have learnt from the Proof of Concept is that blockchain has the potential to fundamentally change the way we operate in the asset management industry, and Irish Funds has been a visionary in trialing the technology at such an early stage in the blockchain journey. Access all of the articles in the Spring 2017 Newsletter: Fund Focus. Irish Funds is working with industry participants and Deloitte to develop a blockchain proof of concept for regulatory reporting.